As summer approaches, my thoughts always float away from my inland life and wash up on the beach. Whether I manage to make the trip this year or not, I can close my eyes and feel the cool, wet sand under my feet and smell the salty breeze as it blows my hair across my face. When I was a child, I loved to dive through the waves as they rose to full height before they crashed on the shore. I loved picking a spot at the edge of the water and planting my feet so that the ebb and flow of the tide would move the sand and bury my toes, leaving me with a feeling of being rooted on the shore and a part of the seascape. The higher the tide, the better — the bigger the waves, the more exciting. As the sea ebbs and flows, so do our lives. In my younger years, I would walk for miles along the edge of the water, feeling the shifting surface of the cool sand call my muscles to flex and shift as well as my legs worked hard to maintain balance on a shore that seemed to move and change with each new wash of cool, salty water. I could feel the power of the sea, and my awareness of the way my own energy worked to keep me upright would create for me a sense of kinship with the endless power of the vast ocean. Each time the water would wash over my feet and challenge me to find my center, I would feel as though the power to stand were being transmitted by the very force that threatened to knock me down. Now that my desire to challenge the surf has been tempered by my desire not to let my bravado override my good sense, I find myself seeking the ebb rather than the flow. I search for the times when the tide will be low and wear my shoes for protection as I walk the shore and look for the gifts from the sea. I am amazed every time at the beauty and variety of the shells and stones that are deposited on the shore by the incoming waves. Their splendor calls us to remember that function is not the only thing in life that is important. 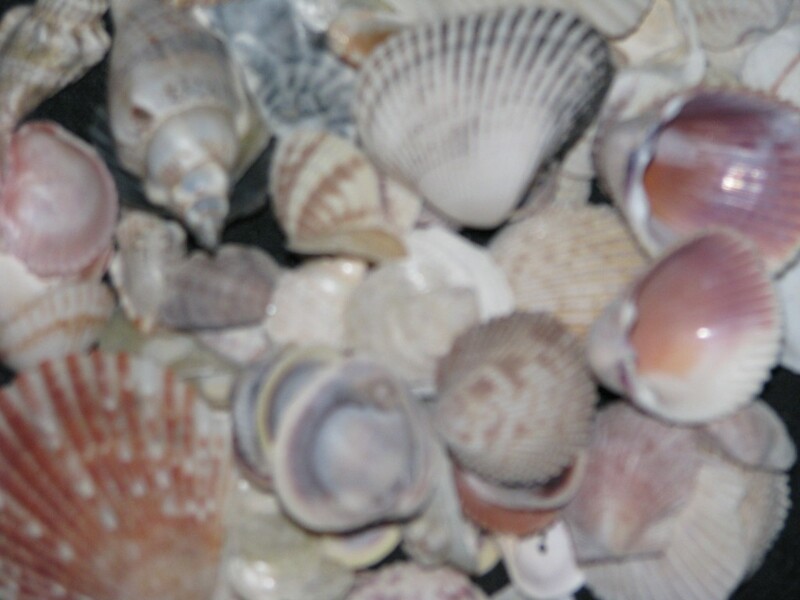 Why, I ask, should the animals who make these shells their homes wear such a stunning variety of shapes and colors? A simple, gray clamshell would do for protection; yet we are treated to pinks and purples and iridescent rainbows of delight. Is it any wonder that people who have lived only by the sea, with no contact with concrete and asphalt, would adorn themselves with these wonderful gifts from the sea? Before I die, I will gather some of my ocean treasures, string myself a necklace, and wear it to the oceanside. There, I will sit — empty and choiceless — and wait for the next gift the sea has to offer. I will close my eyes, find my own place in the vastness once again, and carry home another memory of my own kinship with the infinite universe.